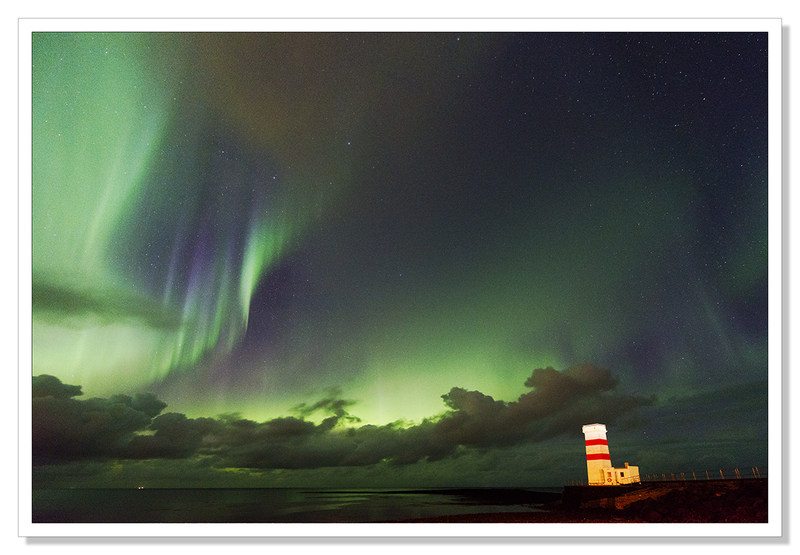 On Wednesday night, the Icelandic Met Office Aurora forecast was ‘Severe’. This was as high as the scale goes and I’d never seen it at anything above ‘Very Active’. I’m not sure why they should use the word ‘severe’ when talking about the aurora but I guess it must have something to do with the potential for disruption to communications that comes with solar flares. The weather here in Iceland had been awful all day. But ever hopeful, after dinner I set off for Grotta Lighthouse in the west of Reykjavik. As I pulled into the car park and looked up, the clouds parted momentarily to give me a taste of what might be before closing in again. The rain started and I thought that was it. 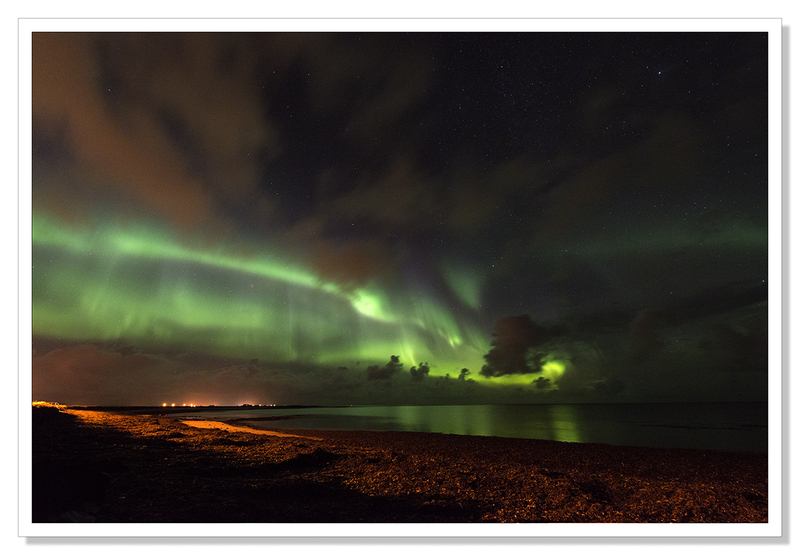 My one chance at a really decent show of the Aurora Borealis and the weather was not playing ball. On a hunch, I left Grotta Lighthouse (to be honest I wasn’t too happy with the level of orange sodium light pollution from the city) and I set of for the most westerly point I could think of that wasn’t too far out from Reykjavik. The point I had in mind was the small town of Gardur, not far from Keflavik Airport. I knew there was a lighthouse there as well as a daymark complete with the traditional red stripes. I figured if I could get beyond the terrible weather, this would make a good foreground subject while I waited to see what a ‘severe’ show of the Northern Lights might reveal. It rained all the way to Keflavik, it was only as I pulled into Gardur that the rain appeared to be stopping. I drove through a town all tucked up for the night to the lighthouse and daymark where, not surprisingly, I found several photographers with tripods set and looking skyward hopefully. I couldn’t get near the daymark for the other photographers so I set up on the beach and waited. It wasn’t long before the clouds thinned and I could see stars. Shortly thereafter, I was witness to one of nature’s most mesmerizing light shows. It started quite gently, just along the beach..
And went on from there.. It wasn’t long before it started to rain again. It was about 1am and I was considering heading home as indeed the other photographers appeared to be doing. I hung back though, once again on a hunch and waited. The skies cleared shortly thereafter and with the ‘competition’ gone, I could finally set up the shot I’d had in my mind’s eye before arriving in Gardur. What I hadn’t bargained for was quite how intense the light show turned out to be and I certainly hadn’t imagined being able to capture the aurora and the Milky Way in the same shot but there it was. I was so glad I hadn’t given up.. This entry was posted on October 10, 2015 by Chillbrook. 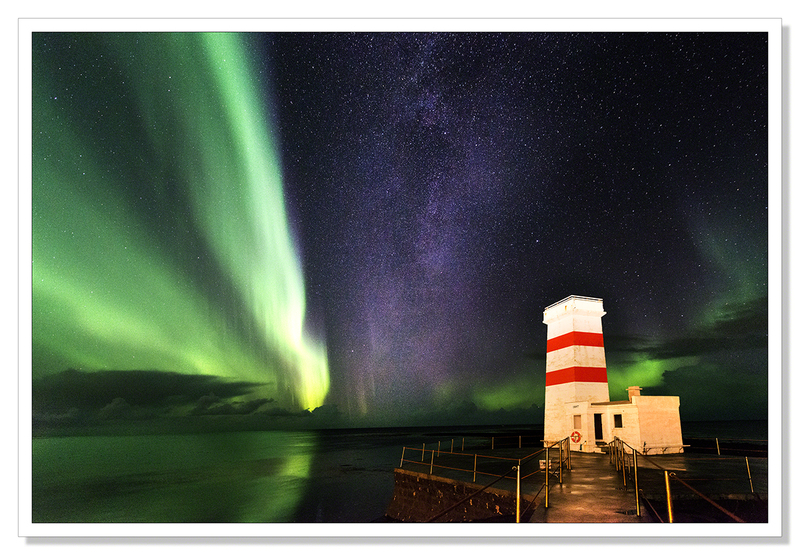 It was filed under Photography, Photography and Travel and was tagged with Adrian Theze, Aurora Borealis, Iceland, Landscape Photography, Nikon D800e, Northern Lights, Photography, Seascape. Wow… what a stunning series of images here!!! Oh my Adrian, I cannot tell you how envious I am of your experience. I don’t care if you ever got a shot off (altho thankfully for those of us who follow you, you did!) but just SEEING the show must have been a life-changing moment. Absolutely breathtaking. It must have been wonderful to stand under such a powerful sky. I did not realise that there could be so many colours, or that it could fill the sky, as you show. Beautiful. My oh my – quite pleased, Adrian? I would have been chuffed to bits! What brilliant hunches you have…. Phenomenal shots Adrian. I thought the first image was spectacular, that vivid lime contrasting with the orange on the beach, but then I saw the Milky Way. Oh wow! What a sight! Is the lighthouse lit up like that from the light in the sky? It must have been almost heart-stopping watching that light show. I am sure there will be more for you, but that has to be something extra special. Thank you for the chance to experience it with you. Wonderful! The aurora is quite the show stopper. You have really done justice to the “out of this world” experience it is to watch the sky light up like this. Thanks so much for sharing! Glad you stuck around after everyone else left, what a payoff! Really love that last shot! Oh I know exactly what you mean! I felt the same with the lunar eclipse. I think I had about 3hrs sleep that morning ;-) When you capture something that seems to sing to your soul it makes everything worthwhile! Utterly amazing! My favorite is the last shot without the distraction of the lighthouse (?) It looks like an astounding storm of colors. Adrian, these shots are just feasts for the eyes ~ wonderful work! Thank you so much Randall. I’m so glad you enjoyed the pictures. These shots are stunning and the last one with the green clouds and the wave of orange colour is OUTSTANDING! Good on you for sticking it out and waiting (given your challenges) and it certainly paid off. 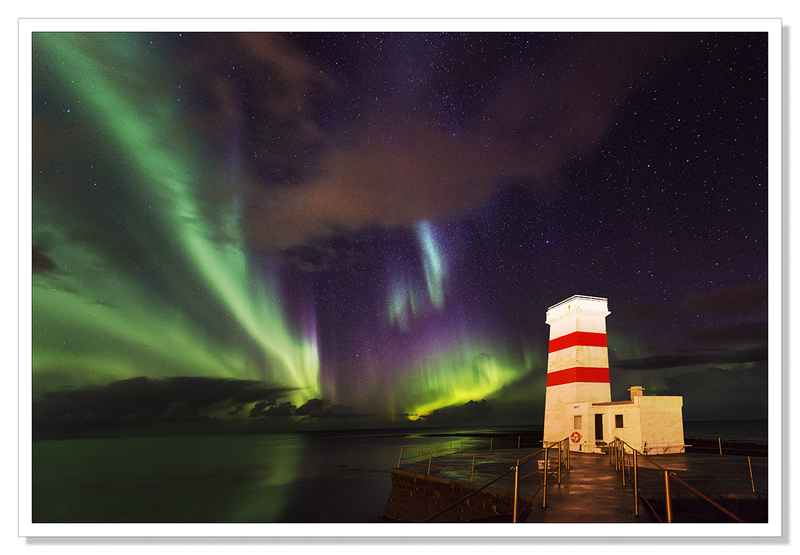 I have never seen an aurora but both that and Iceland are on my bucket list. These are breathtaking and I had to move to my larger screen to look again. Bravo! WOW! Amazing photographs!! Thank you for sharing with us! 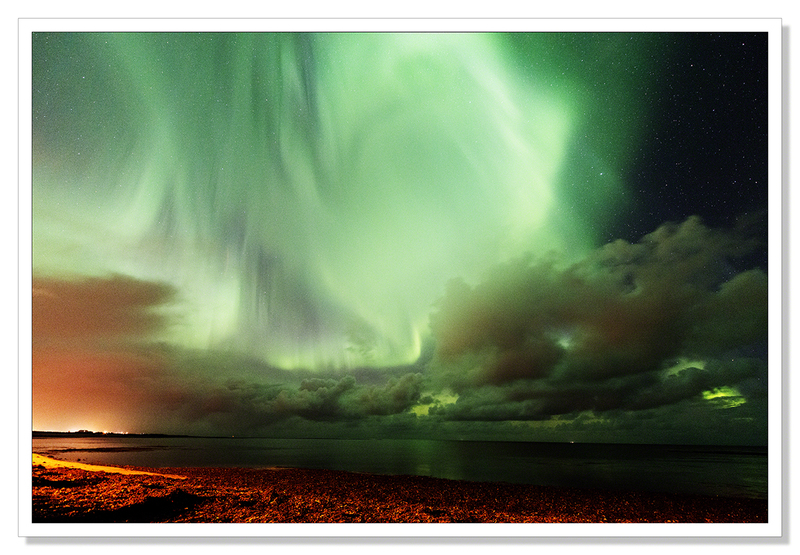 Fabulous images Adrian….the Northern Lights are impressive enough, but the shoreline in the first and last images look like rivers of molten lava. Its very dramatic. Half way through our road trip and SO much more fun and photography to be enjoyed, what a time we’re having with it all ! I am soooo envious! Love the photographs. Thank you Cynthia. I hope you get to see the show also! These are crazy beautiful, Adrian! I admire and appreciate your tenacity and commitment to making outstanding work. You are amazing! Aww thank you Karen. That means an awful lot to me! Despite the initial not so good forecast, in the end you got some amazing photos. I have seen aurora a couple of times, but never anything like this. Must have been breathtaking! Truly superb shots, Adrain. The best Northern Lights wie have seen for ages. Amazing. Your instincts served you well! I love the clouds mixing with everything else. First and last are my favorites, I think because they look more inviting and real to me. Thank you very much Joshi! You’re very kind! Superb – precisely what I required was a solid base and interesting foreground – not a moving ship – we live and we learn…. Not easy to get a good shot from a moving ship that’s for sure. I liked you pictures very much nonetheless! Thank you. It really was stunning to witness!